On this date in our family history . . . the 31st day of January . . . in the year 1872 . . . Edgar and Emma Henry are born at Old Independence in Washington County, Texas . . . Edgar and Emma were the 4th and 5th of eight children born to William Paschal (1836-1912) and Josephine Wingfield (Davis) Henry (1842-1899) . . . Edgar and Emma's parents took up residence in Milam County, Texas c. 1876, when the twins were about 4 or 5 years of age . . .
Edgar married Berta Mary Sharp (1873-1955) on 02 January 1895 in Crockett, Houston County, Texas . . . Berta was born 10 November 1873 in Houston County, the 5th of six children born to Samuel Houston and Mary Alexandrien (Lemaire) Sharp . . . FYI . . . Edgar's twin sister, Emma, had married Berta's older brother, Sam Houston Sharp, Jr., a few years earlier . . .
Edgar and Berta set up housekeeping in Milam County where Edgar's parents lived until their deaths (1899 and 1912) . . . they then moved to West Texas for a while early in the 20th century, but returned to Rockdale ca. 1939 shortly after two of their grandchildren moved in with them on a permanent basis . 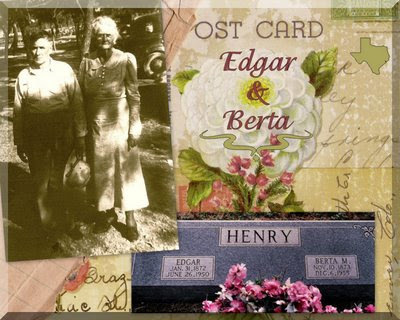 . . Edgar and Berta both died in Rockdale, and were laid to rest at Oaklawn Cemetery . 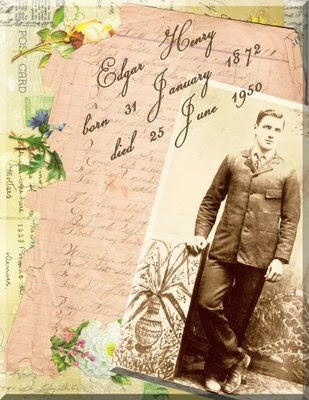 . . Edgar is the paternal great-grandpa of the Keeper of this family history blog . 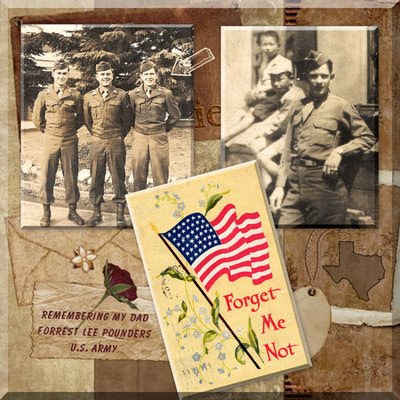 . . a goodly number of Edgar and Berta's descendants still live in Rockdale and Milam County at this time, and others from across the state sometimes return to Milam County in the Autumn of the year for a family reunion . . .
FYI . 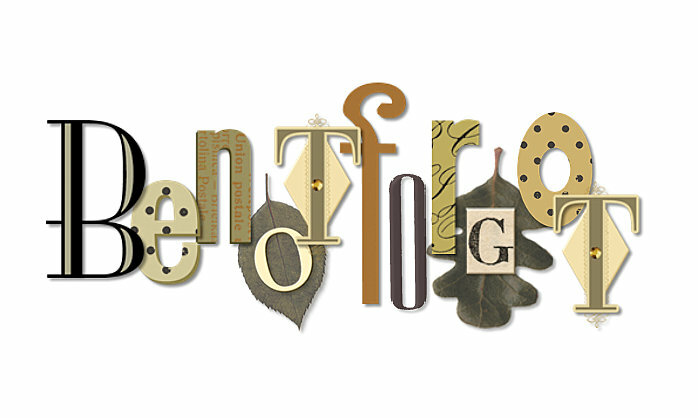 . . the above collage was created by very carefully placing a torn and crumbling ledger page on a flat-bed scanner . . . and then layering on top of it a floral file folder from a local discount store . . . those two items were scanned together as one image . . . then using Picasa . . . that image was cropped . . . a second collage was created by adding the photo of Edgar . . . the text was also added using Picasa . . .
That fragile handwritten page came from a ledger belonging to Edgar Henry, and contains lyrics to old folk songs . . . this particular page contains a version of a set of lyrics to a song called The Package of Old Letters . . . as you can see, part of this page is missing, so I'm guessing at the closing lines, but here are the words I think my great-grandpa penned on these pages . . .
Never from my finger part. Labels: 19th Century, 20th Century, Davis, Henry, Houston Co., Lemaire, Maternal Ancestors, Milam Co., Month of January, Runnels Co., Sharp, Texas, Washington Co.
Infanta Maria of Portugal -- 23rd great-grandma of the Keeper of this genealogy blog, & 19th great-grandma of our Josephine Wingfield Henry nee Davis -- was a Portuguese infanta, first daughter of King Afonso IV of Portugal & his first wife Beatrice of Castile. Her maternal grandparents were Sancho IV of Castile & María de Molina. She was born on 09 Feb 1313 & became Queen consort of Castile by marriage to Alfonso XI in 1328. She was the mother of Pedro of Castile. She died in Évora on this date in 1357 & is buried in the Chapel of the Kings in the Seville Cathedral. From September 28, 1840, to November 18, 1851, Nicholas Adolphus Sterne kept a diary of his daily activities, which is a valuable source of information on the period of the Republic of Texas. The names of some of our kith 'n kin are scattered through these pages, including the following mention of Mrs. Elisha Roberts, who is a 4th great-grandma of the Keeper of this blog. Mrs. Sublett is one of her daughters.